I come home from work and take a quick peek at the forums before starting to make dinner. Oh look, what is this thread in ALL CAPS? 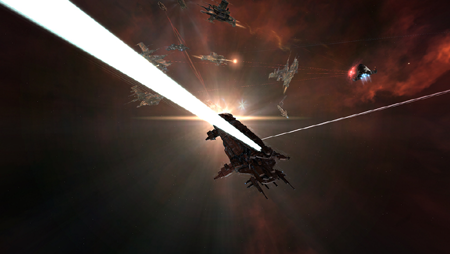 Carrier + 5 Caldari Navy Ravens are in the process of running a site, and we need to log in to kill them. Screw making dinner, it is time for revenge for Slumber’s carrier loss. I log into vent and fire up Eve. Only 4 people on; not a good sign. I get in game and start to help get people organized. Luckily we are heading into US TZ primetime, and we get a bunch of folks logging in. We also get a bunch of guys who read aka’s forum post coming back, and 30 minutes later we have a gang of 14-15 people all at the Static WH, on the Exodus side. We send Kirian in to find the hostiles. He tracks them down to a magnetometric site, and we try to figure out on what wave they are working. Initially, we think they are on the 2nd wave, and Kirian comes back with some bookmarks. We then send him back in and discover that they are on the last wave, and only have a few ships left. Oh crap, we need to hurry. Merk orders the fleet to jump in, and tells us to hold cloak, though he was slightly late with the second order and we have one guy who uncloaks. He quickly jumps back into Exo, but apparently the hostiles got nervous, because they start to warp away from the site. Initially, I thought that might have actually been an OK turn of events, because then we might have been able to catch their carrier. We all warp to the site and find it empty of hostiles. Crap! We quickly warp to the other WH in system – a C3 – and put up a bubble, but the hostiles are all at a safespot or something. Kirian starts probing them down and gets a hit on the carrier. We all warp to him, but the carrier warps off. For some reason, he warped to another safespot that was only 2000km away…so Kirian quickly probes him down again. We warp to him, but the carrier warps off again. When we land, however, one of the CNRs is still there, so we go after it. One of the hictors pops a bubble, and we start shooting the CNR. Suddenly, another CNR warps in. And another. And another. And another. And the Carrier. Yay, we got them all to come and fight! They all start popping smartbombs, and wrecks start appearing. Not their wrecks though. Uh oh. 3 of them target my Curse, which was already hurting from the smarties. I start aligning, but I am too late, and they pop my Curse. Luckily I am out of smartie range, and manage to get out of the bubble and warp back to the Exo WH. Unfortunately, 5 other pilots don’t make it out, and we have 5 guys podded. Things are looking grim. Finally some good news: a Proteus and the remaining Hictors are still alive and don’t even seem to be taking that much damage. I make it back to Exo and get in my Carrier. If they want a fight, I am going to bring one. Folks in the little ships warp off, and I jump into the C6. I assign fighters to Merk in the Proteus and warp to the hostiles at 10km. As soon as I land, I send in the fighters and start repping friendlies. At this point, we start being smart about the bubbles. The Hictors all switch to infinite points, and the hostiles have no points; they can’t lock us down. If someone is taking more damage than I can rep they can just warp off. We set up a rotation for the Hictors, and they periodically flip off their infinite point so I can rep them. We have all of the hostiles locked down at least, and seem to be in a sort of stalemate. People start switching into Neut BSes. Rogue Merlin switches into his DPS Paladin. We try targeting the Carrier; we try the BSes, and we can’t break the carrier’s tank or RR. At this point, all our jammers have been popped. I log in my alt – who has Caldari BS 3 – to fly the PVE Scorp I have in my hangar. Slight complication: my alt doesn’t have Electronic Warfare trained, but luckily I have it injected, so I start training it. 15 minutes later I bring in the Scorp, but can’t jam the carrier because it is in triage mode. Well, he has to run out of fuel sometime, right? All of a sudden, one of the CNRs disappears. WTF? Apparently, they logged the CNR pilots out. We concentrate fire on one of the CNRs that we managed to nearly kill before, and seem to be able to slowly take it down. We pop that one, and start on another one. That one disappears, so we target a new one. We manage to get one more CNR before they all go, and now it is just the carrier, and he is tanking all we can dish out. We get some great news. Avatar Penguinkind has been scanning the C3 and found a highsec exit 1 jump from Rens. Allamarr’s characters had all been podded back to empire and they jump into stealth bombers and other DPS ships and rejoin the fight. The carrier is now slowly dropping. Just before he pops, he jettisons a Buzzard. After his carrier popped, he jumped in the Buzzard and tried to make his escape. We pop the Buzzard and hold down his pod. Everyone activates some mod (Neuts, ECM, etc.) on the pod to get in on the killmail. We even wait for a few folks to come back in from empire, and then pop the pod. We loot the wrecks and also go loot the mag site which they had kindly cleared for us. We have to take a few BSes back to highsec to fit back into Exo, but made it back in the end. Total time elapsed was about 2.5 hours of fighting, plus another 30 minutes of getting people back into Exo.